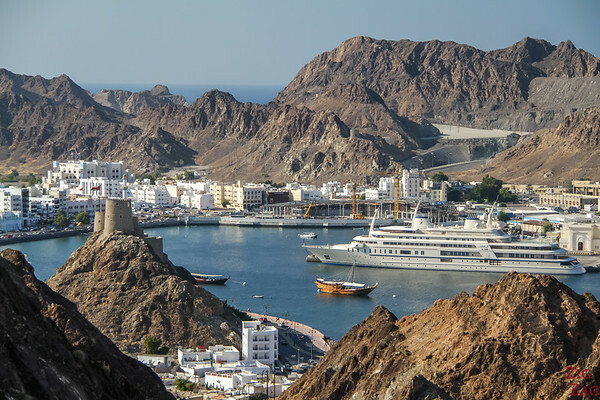 Let's discover the best thin﻿gs to do in Muscat Oman to help you plan your trip! 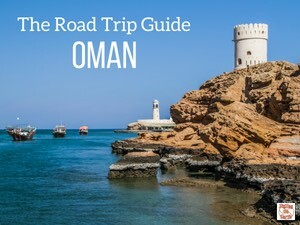 Should you have only one day or several days, here is a list of places to visit in Muscat as well as activities depending on what you like: architecture, history, water, nature etc... (with a map of Oman) But Oman is much more than just its capital Muscat, so I also recommend some day trips to discover more of the beautiful Omani landscapes. Some of those places to see in Muscat even made my list of top things to do in Oman! It is not so easy to get oriented in the Capital City and find all the places to see in Muscat. The city is spread and separated by hills. To help you, I have drawn a map and collected information about transport options. Below is an approximate map I draw with the various touristic areas of Muscat and the main things to do in each. My experience of taxis in Oman was not really good. Mostly because they only knew the major sights but not the streets. Apparently they do that part time, so their knowledge of the city is limited. But if you drive only between major sights, airports and main hotels it should be ok.
You have to agree on the price beforehand. There is a plan to introduce meters but it is not yet implemented... Between the various areas of the city it should not be more than 5 to 10 OR (13 to 26 USD as of Dec 2015). Not really buses, the baisa buses are minivans not clearly marked. If you want to attempt it I recommend asking locals. Hop on Hop off Bus by BigBus - considering the spread of the city, it is quite practical. The first bus departs Mutrah Souq at 9am and buses depart every 30 minutes until 5pm (last return at Mutrah Souq at 6:45pm). Timings are subject to change especially during Ramadan. I was really surprised how easy it is to drive in Muscat. The roads are in very good conditions, people are courteous and calm. The old town is where sometimes there are traffic jams but otherwise, I think it is a good solution. For more information check out my article dedicating to Driving in Oman. You can also join organized half day or day tours or book with a private guide. In that case, you just have to sit back, relax and follow the guide. For a full day private tour of the city, count 200 to 300 USD. 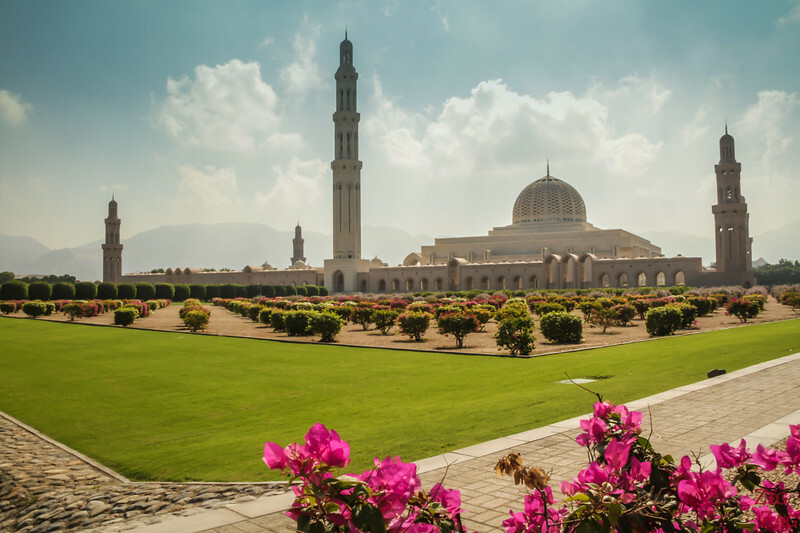 If there is one place to visit in Muscat, it is the Sultan Qaboos Grand Mosque. It is an architectural masterpiece both from the outside and from the inside. It is the absolute top thing to do in Muscat. Discover many more photos and Information to plan your visit in the Sultan Qaboos Grand Mosque article. Another recent building in Muscat is the Royal Opera House. With handcrafted decors all around, you might not even notice how technical the building is, but is it also a masterpiece in that sense. 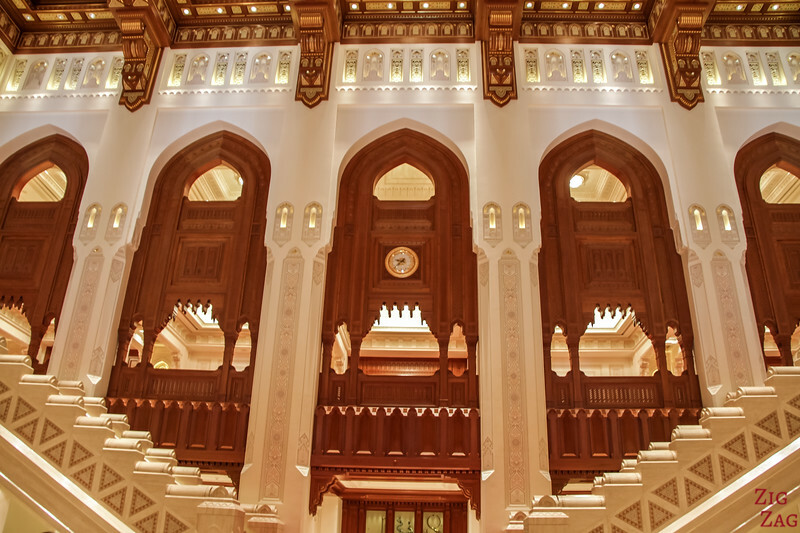 This is why the Opera is one of the main places to visit in Muscat either as a tourist or for a performance. Discover many more photos and Information to plan your visit in the Royal Opera House article. The heart of Muscat is around the Sultan's Qasr Al Alam palace and the two 16th century Portuguese forts of Al Jilali and Al Mirani. They are not open to the public but you can admire them from outside. Discover many more photos and information to plan your visit in the Forts and Palace article. There are many more mosques in Oman. Most of them are not opened to the non-muslims. However you can go to Mohammed Al Ameen Mosque, well rated in trip advisor. 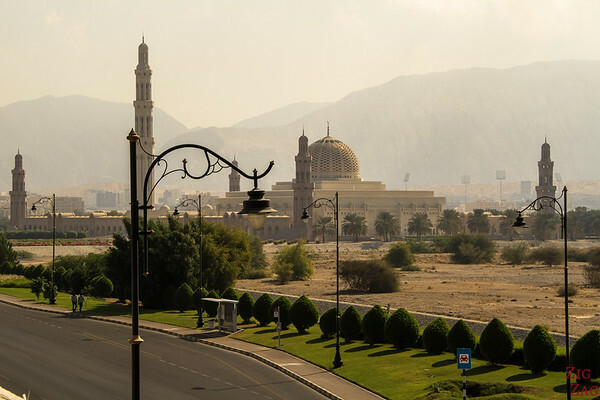 And you can check out the list of Muscat Mosques by OmanTripper. 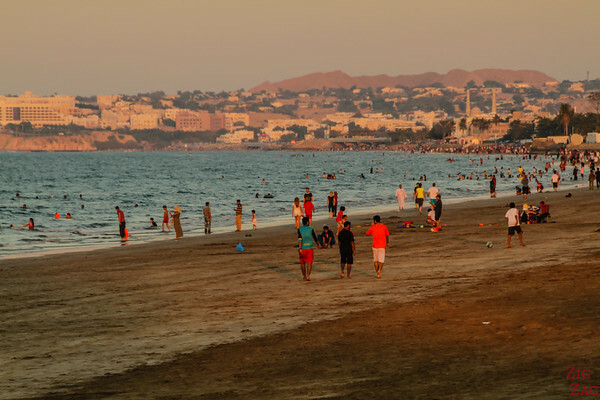 Qurum beach (or by its full name Shatti al-Qurum) is the main beach in Muscat. It is a long stretch of Golden sand where locals come relax during the weekend. Another great thing to do in Muscat is to discover the shores to the South by boat. From the Al Rowdha Marina, you can take 2 or 3 hour tours including dolphin watch, snorkeling, or just enjoying the work of erosion during daytime or at sunset. 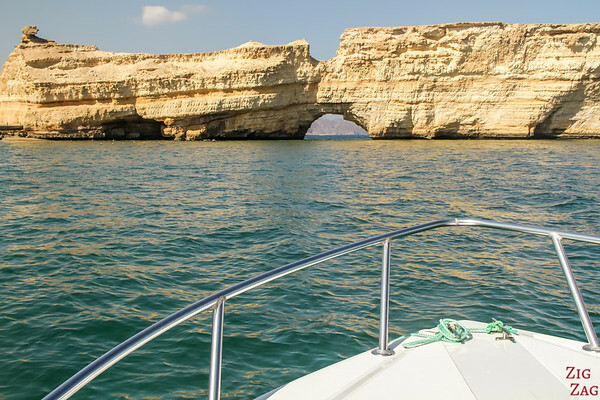 Discover many more photos and information to plan your visit in the Muscat Boat tours article or the post about the Daymaniyat Islands. The Mazara dam is just outside of Muscat in the mountains. It is not always flowing but people say the lake is beautiful. 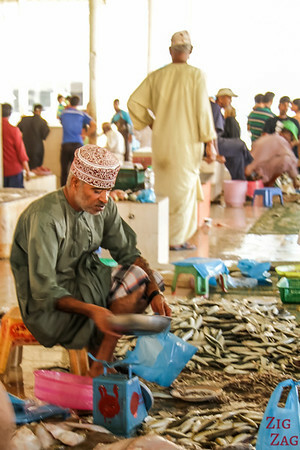 If you want to glimpse at the life of Omani people, the Fish market is a must place to visit. Active early morning you can see the boats arriving, the fish being sold and then prepared. It is one of my favorite activities in Muscat but wear closed shoes!!! Discover many more photos and information to plan your visit in the Muscat Fish Market article. 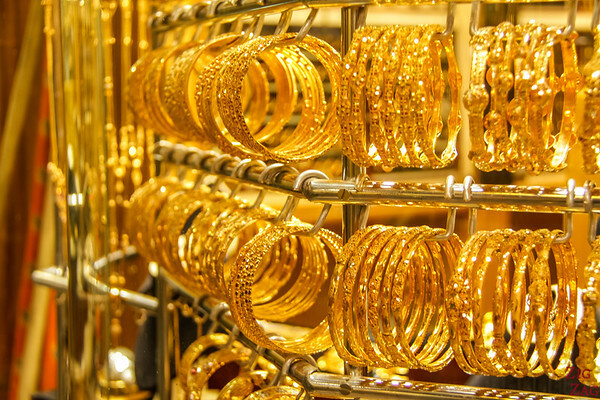 Not far from the Fish Market you can walk through the old city and the Souq, especially the gold section. 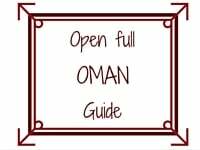 Discover many more photos and information to plan your visit in the Muscat Corniche and Souq article. If you want to move a little and capture some great views of the city, you can hike above Riyam. It is an original activity in Muscat to get away from the crowds. 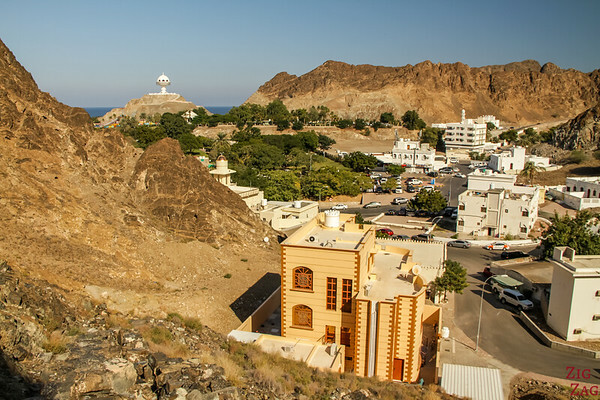 Discover many more photos and information to plan your h﻿ike in Muscat. The Riyam park is great for a stroll. It includes 2 hills giving scenic views of mountains and the corniche. There are also a great playground for children. In the photo it is the green area under the Incense Burner Tower. Another classic is the Qurum Natural Park located in the Qurum residential area. A well maintained park in the heart of the city. You can also drive in the hills behind the park for more views of Muscat. Raters on Tripadvisor have placed Bait Az-Zubair and the Armed Forces Museums in the list of top things to see in Muscat. The National museum has now opened in its new building (since december 2015). Apparently it is really modern so it might make soon the top list. As those museums do not have official websites, it is difficult to make sure you have the proper opening hours. I did my best, but cannot ensure those are correct. If you have some more days in Muscat but don't want to go on a round trip one of the things to do in join a day trip. Many are possible and below is a selection of the best ones. On the way back you can stop at the Sink hole; which is very easily accessed from the main road down to Sur. It is a hole in the ground filled with beautiful water and bordered by the sea on one side and moutains on the other. A classic among tourists stopping one day in Muscat on their cruise, is to get up to Jebel Shams, also known as the grand canyon of Oman. Nizwa is another large city in Oman. The drive will be 1h30min. In the center of the city, you can discover a beautiful Souq, the castle with many cultural displays and climb to the top of the fort for breathtaking views of the oasis. If you don't mind a longer day tour with a lot of driving you can reach Wadi Bani Khalid and the sand dunes of Wahiba Sands. Plan 2h30 drive in each direction. Long, but it gives you 3 different landscapes of Oman in one day: city, wadi and desert! Or even better you can book a 2-day tour to spend the night in the desert! You can also do many day trips to the surrounding beaches along the North and South coast of the many but less known wadis everywhere. The list would be too long. And if you feel adventurous and want a true off road experience, I recommend the Salmah Plateau with its vast areas, huge caves and prehistoric tombs. This is amazing! My friend is on her honeymoon at the moment in Oman and I was curious as to why – after reading this now I know! Ahah. When I was telling people where I was going, I had those who said ‘this is a country?’ and the others who were ‘what is there to see, desert?’. Yes Oman is beautiful and has a lot of variety. I hope your friend is having a great time.